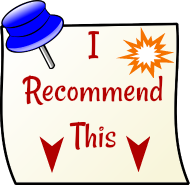 Here is the Best Apple Pie Recipe ever! My daughter used to work at a country bake shop, and when she makes pies with apples for our family, THIS is the recipe she uses! 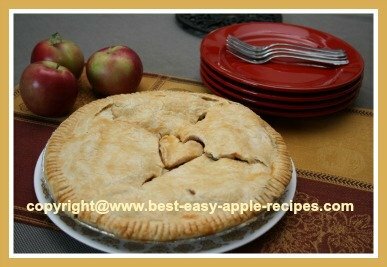 A basic apple pie recipe with the very best results! Turns out every time! The aroma that fills the air in the kitchen, and the whole home when baking apple pie is sooo good! Serve apple pie plain, or topped with vanilla ice cream, whipped cream, whipped dessert topping or cheese. Combine the sugar, flour, salt and cinnamon in a bowl and mix well. Turn the sliced apples into the prepared crust, alternating with the dry mixture, and ending with the dry mixture on top. Dampen (paint) the edges of the crust with the lightly beaten egg, and place the second crust on top. Trim, and crimp the pie edges to seal. 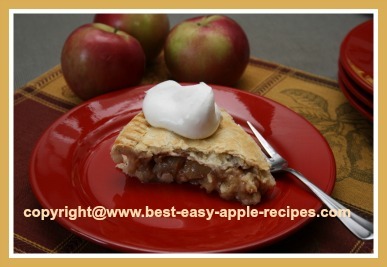 Enjoy this ScRuMpTiOuS Apple Pie! Do you ever have problems with the edges of the pie becoming too dark or burning when in the oven? 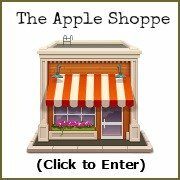 Looking for Apple TART Recipes?